Tomorrow the crew of the International Space Station will open the hatch of the HTV-7 spacecraft and start unloading its cargo. Like other cargo spacecraft that can’t land, after its departure it will be used to eliminate hardware that failed or however old and various wastes, which will disintegrate with the spacecraft reentering the Earth’s atmosphere. 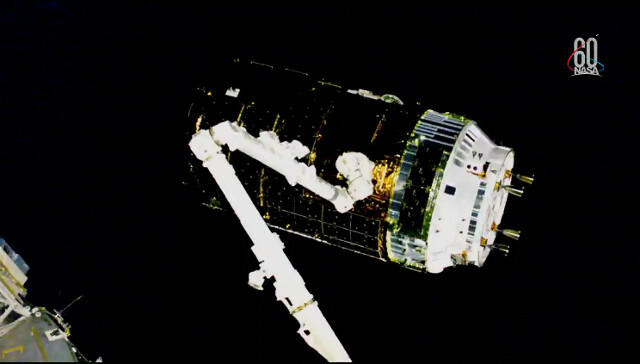 The Kounotori will remain docked with the International Space Station for about two monts but the date is approximate and can be changed if other activities will take priority. This is more true than ever for this mission because according to the original plans the cargo spacecraft was supposed to blast off on September 10 but above all the really bad weather in the area around the base it was launched from caused a considerable delay. The most immediate consequence is on the schedule of installation of the new lithium-ion batteries on board the HTV-7 cargo spacecraft. Two spacewalks were scheduled to complete the operations needed, one by Alexander Gerst and Drew Feustel and another by Gerst together with Ricky Arnold. However, the two NASA astronauts Drew Feustel and Ricky Arnold must also prepare for their return to Earth on October 4th. The new schedule for the spacewalks should be announced very soon. The HTV-7 cargo spacecraft’s departure date is significant even if the resupply mission was accomplished because its re-entry into the atmosphere will occur over a part of the Pacific Ocean different from its usual one. There will be a different mission coda for the re-entry experiment of the small HTV Small Re-entry Capsule (HSRC), which will test the possibility of returning samples to Earth. For now the supplies reached the International Space Station and a few minutes earlier than scheduled and that’s positive.